Fossilized bones discovered in Texas from a flying reptile that died 89 million years ago may be the earliest occurrence of the prehistoric creature known as Pteranodon. Previously,Pteranodon bones have been found in Kansas, South Dakota and Wyoming in the Niobrara and Pierre geological formations. This likely Pteranodon specimen is the first of its kind found in Texas, according to paleontologist Timothy S. Myers at Southern Methodist University in Dallas, who identified the reptile. The specimen was discovered north of Dallas by an amateur fossil hunter who found various bones belonging to the left wing. Pteranodon was a type of pterosaur that lived about the same time as some dinosaurs, about 100 million to 65 million years ago. 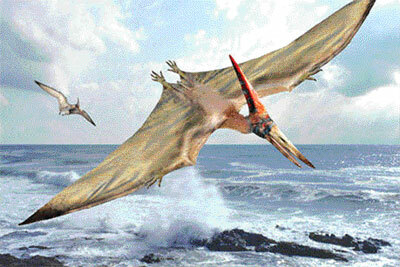 The only reptiles to dominate the ancient skies, pterosaurs had broad leathery wings and slim torsos. The specimen identified by Myers is an adult pterosaur of the toothless variety and while larger than most birds, wasn't among the largest pterosaurs, Myers said, noting it had a wing span between 12 and 13 feet, or 3.6 to 4 metres. It was discovered in the Austin Group, a prominent rock unit in Texas that was deposited around 89 million years ago, early in the geological time period called the Late Cretaceous. Pterosaurs, many of which survived on fish, lived at a time when a massive ancient sea cut across the central United States. The Western Interior Seaway was a shallow body of water that split North America in half from the Arctic Ocean to the Gulf of Mexico.More than a thousand Pteranodon fossils have been unearthed from the middle part of the seaway.No definitive Pteranodon specimens have emerged from the southern part that is now Texas. Key to identifying the SMU fossils as Pteranodon is a humerus of 5.7 inches, or 14.5 centimeters. The humerus is the uppermost bone in the wing and attaches to the torso. The humerus of the SMU specimen, while complete, did suffer some damage during fossilization when it became compressed and distorted through millions of years of compaction. "If it wasn't crushed so badly, it would be possible to determine if it really is Pteranodon," Myers said. "'While it's difficult to narrow the humerus definitively to a specific genus and species, some features clearly identify the specimen as part of the Pteranodontidae family, most likely the genus Pteranodon. Discovered along with the humerus were parts of the elongated fourth finger that in pterosaurs forms the wing. The fossils do not solve the mystery of the reptile's cause of death, Myers said. But it appears the animal probably died in flight over the sea and then fell into the water. If the specimen represents Pteranodon, Myers said, it would be the oldest one in North America by a million to two million years, and the second oldest pteranodontid in the world.